A delightful bestseller when first published in Japan, this charming illustrated book takes readers inside the magical realm of books, libraries, and bookstores. 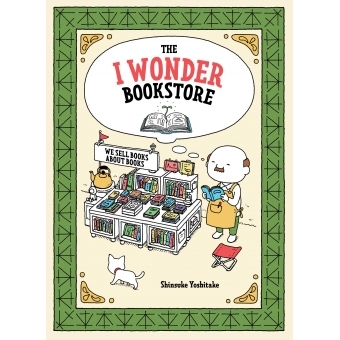 At The I Wonder Bookstore, customers come in and ask the owner countless variations on its namesake question ("I wonder if you have any books about...") and he is happy to fill their requests in enchanting ways. In these pages readers will discover books that grow on trees, books designed to be read by two (or more) people at once, books that can only be read by moonlight, bookstore weddings, an underwater library, a boot camp for charismatic bookstore attendants, and many more wonders that celebrate the transporting magic of reading in a timeless and irresistible way.